When developing a new generation of machines, finding an answer to the question that follows is only a secondary step: How can we divide a machine or facility so that, after it has been manufactured, it can be set up by the user in a short time and with the least amount of resources? Modularity provides a promising perspective: the developers have divided the machines or facilities into functional groups which are installed separately and then assembled into functioning units or production lines only then when they arrive at their final set-up site. 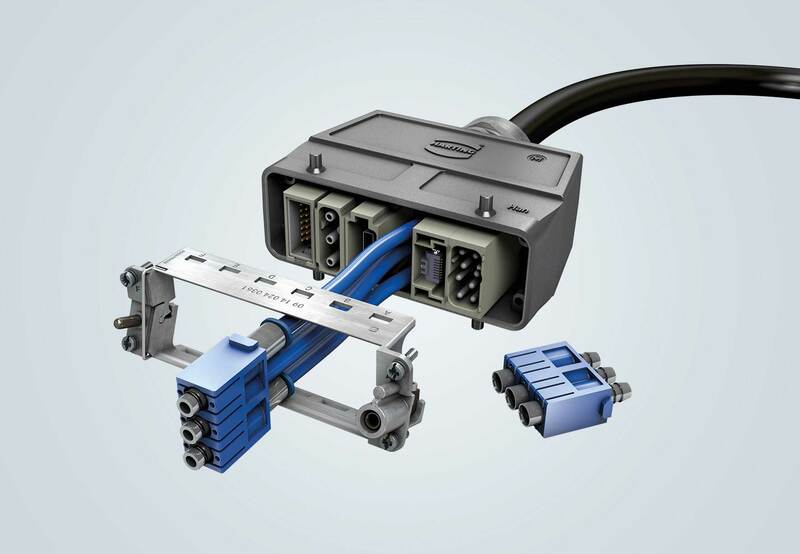 Such a modular approach is only possible when versatile connectivity technology is used: industrial connectors enable easy and safe electrical interfaces to be established between functional units. They also handle the necessary transmission of data, signals and/or power. The selected connectors must also be versatile, scalable and open for future extensions. Thus, modular connectors are the perfect solution for many of the interfaces in modular machines or facilities. HARTING offers a comprehensive product portfolio for such applications. Including electrical properties such as rated voltage, current capacity, data rates, EMC properties of the inserts, hoods and housings, space requirements, interface weight, as well as handling and ease of assembly. Based on these criteria, a suitable interface that is scalable, cost-effective and functionally optimised can be put together from HARTING’s modular units for each stage of a machine module. Learn more about modular connectors! Just how versatile it is to design interfaces using Han-Modular® is illustrated by the example of a high current 40-amp interface. Such an interface could be used as the power supply for entire machine modules, for motor controls or for heaters. The user need only specify the current carrying capacity of the power contacts. The Han-Modular options then provide the additional specifications for the interface. It can be implemented with numerous variants: You can choose from six different Han-Modular® modules with 70 A current carrying capacity – four crimp and two axial screw terminations – as well as various Han® B-compatible hoods and housings from the Han® product portfolio. The critical aspect from the user's perspective is that the solution should work in various machine and facility configurations. Interfaces for sensors, drive units, I/O boxes, man-machine interfaces or complete modules must function independently of their concrete positioning. Cost pressures and the need to conserve resources have created a demand for interfaces which are designed for very specific configurations. Often, an important constraint on interfaces is that untrained personnel should be able to assemble them safely and accurately. 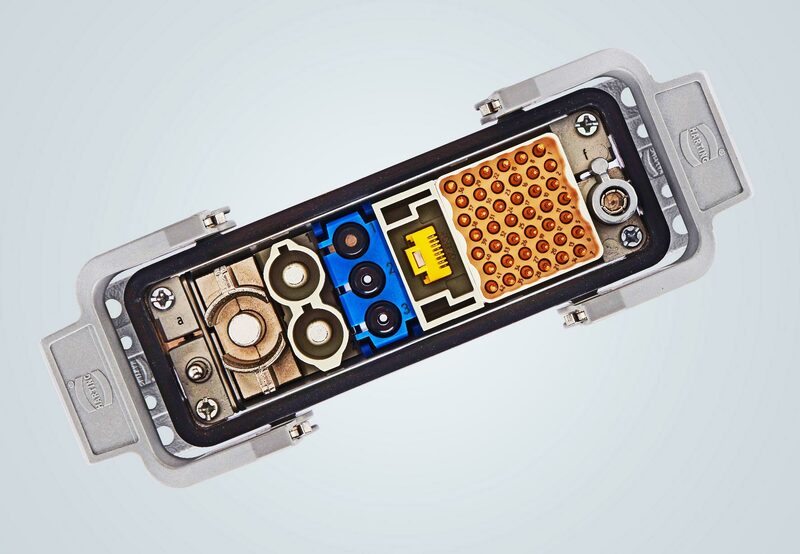 The numerous coding possibilities for the hoods, housings and modules ensure that no errors can occur during the assembly of the modular connectors. That is why these interfaces save time, resources and money in multiple ways: during their assembly, during test runs and during the final assembly of the modular machines.